Great news, great news and great news! Important thing must be repeated for three times. Please mark your calender and save this date: 27th July as we're having a new product launch event in China National Convention Center, Beijing. The launch event is just around the corner, so join us and let's explore the fun of technology ! We will post a live thread on that day so stay tuned with us for latest announcement and information.Check out the invitation ticket here ! 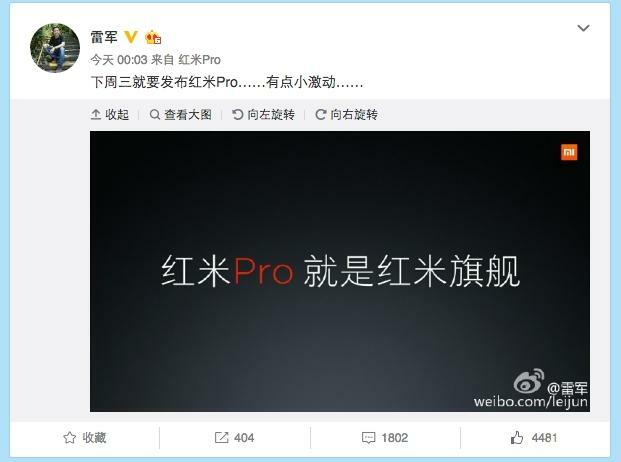 Lei Jun revealed the look of Redmi Pro! Do you like it? Lei Jun revealed that Redmi Pro sports with MTK Helio X 25 10 cores processor. Redmi Pro is the flagship for Redmi series ! In China, sweet potatoes, typically of the yellow variety, are baked in a large iron drum, and sold as street food during winter. What if we mix this sweet potato with caramel? By the way if we translate this dish directly into English it means brushed or polished metal. Does that means Redmi Pro now has a metal body? All nuts have different nutrition credentials and will offer various health benefits. In this dish, we need bamboo shoot and ten different types of nuts as our main ingredient. I would say this dish has crisp texture, refreshing and sweet taste. So you want to know the name of the dish so that you can order in Chinese restaurant? Hmmm, unfortunately there's no specific name for that. However if we try to translate directly into English it's ten cores and dual lens. Sounds weird isn't it? Trust me, this dish is delicious ! The first dish presented by Wu Xiubo is none other than woman's all time favourite dessert. It's very easy to prepare and this dessert taste so good and has a very colorful appearance. Do you like our french dessert : OLED Ping? On 18th July, we finally obtained some clue about what Mi Product is launching in the launch event. The official weibo account of Redmi Pro surfaces. Lets say hi to #Redmi Pro. Pro can be defined as professional, high specs and flaghsip. Seems like the launch event has more than one new product. Besides Redmi Pro, we will announce_______________ in the launch event too ! Can you guess what's that? Can you guess what is the Mi Product we're going to reveal? [Xiaomi Launch Event] Feast Your Eyes With Beautiful Invitation Card ! Xiaomi Has Sold Over 110 Million Redmi Devices. Are You One of The Contributors? Start to wonder from this moment.